TPA Network is pleased to announce the establishment of an industry-focused research consortium to assess the value of emerging medical technologies and health innovations; an initiative that is being met with great interest and support by many leading reinsurance, technology and professional services companies. Precision medicine, opioid alternatives, medicinal cannabis, electronic aspirin, medical wearables; these and tens of other promising new health innovations are emerging...confusing plan sponsors, TPAs and reinsurers alike. At the same time, new means by which to do business are being tested including value-based provider contracting and AI-enhanced plan administration. These changes challenge the stability of those who are slow to accept and adopt change and, while promising, many of these innovations are unproven, expensive, ineffective and wasteful; few have been adequately researched (especially re: ERISA plans). As a practical matter, on average, it takes seventeen years for a new medical technology to be “translated” into widespread use. During this time, an inefficient and dangerous trial-and-error process ensues to determine what works and what doesn’t; what’s cost-effective and what isn’t; what’s dangerous and what’s not. Clearly, this cannot continue. Few TPAs can cost-justify a BUCA-quality Pharmaceutical, Therapeutics & Medical Technology Assessment Committee to conduct research and provide guidance. Nonetheless, this assessment is clearly needed, free from the bias that comes with funding from big pharma, medical device firms and health systems. 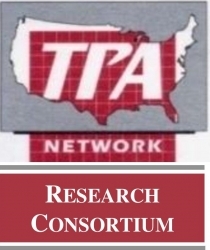 To fill this research and assessment void, TPA Network is pleased to announce the creation of the TPA Network Research Consortium to help TPAs maintain their position at the forefront of change. Each study will focus on assessing one new (or common, yet suspect) medical technology or health innovation as to its efficacy, cost-effectiveness, value, best means of deployment and compliant use. Collectively, the TPAs that operate on just the five leading payor platforms service 30+ million plan participants, a population covered by fewer than two dozen stop loss facilities. These resources can provide access to billions of potentially valuable medical and Rx claims; serve as a huge patient pool from which to source study participants; and create purchasing power able to support efficient research, positively impact patient care and facilitate vast provider outreach. With a TPA-administered population this large, a research study that involves just one half of 1% of this pool could impact or influence as many as three quarters of the country’s ~100,000 primary care practices. With this level of provider engagement, the Research Consortium could meaningfully accelerate the translation and diffusion of a new medical innovations. The pressing need for new technology research, assessment and guidance emanates from the transition to the evidence-based, value-oriented paradigm and the application of new technologies to healthcare (e.g., that enable access to, and make sense of, billions of siloed claims data, once thought to be worthless). To support this research, the Research Consortium is building a secure, interoperable, blockchain-based neural data collection and warehousing capability; leveraging AI and machine learning to enhance administrative and operational efficiency; and integrating new technologies able to enhance patient and provider engagement. For consistency, efficiency and speed-to-deployment it has begun to forge collaborative arrangements with leading payor platform companies, health data management and analytics firms and patient/provider engagement tech firms. In that bench-to-bedside translational research is best conducted using a pragmatic study approach and real world evidence, the Research Consortium study teams will include a broad range of researchers, scientists, physicians and professors affiliated with the nation’s top academic research institutions. By example, the first study, focused on precision medicine. includes researchers from Duke University; MIT, Drake University, the Salk Institute and the Uniformed Services University of Health Sciences. Reinsurers should have a keen interest in how their clients handle health innovation assessment for obvious reasons, and the Research Consortium heartily encourage their financial support. The market for this type of research is broad however and, as such, funding for this initiative will also come from study sponsorships; private contributions, academic research grants, subscription fees, program licensing royalties and fees for supporting patient engagement, provider outreach and case management. The Research Consortium looks forward to hearing from potential study participants (e.g., TPAs); collaborators (e.g., technology vendors) and study sponsors (e.g., reinsurers, actuarial and health analytics firms) wishing to leverage the prestige associated with an academic study; increase their brand awareness; and benefit from a front-and-center position as an industry innovator. The Research Consortium’s first study is appropriately focused on the proper, efficient, cost-effective and compliant use of precision medicine by value-based, ERISA-regulated plans. Experts agree that pharmacogenomics will change the way medicine is practiced by becoming the starting point of treatment and the foundation of value-based healthcare. Phase I of the study involve the GINA-compliant PGx testing of 10,000 plan participants managed by some two dozen forward-thinking TPAs. Click here to view the list of recent Press Releases from TPA Network, Inc.